A sentimentality towards material and traditional values underlines Mark Handforth’s collection of new works—all endearingly independent—in his solo show at Gavin Brown. There is a dialogue between the works of course, but they don’t punctuate the space in the way large scale pieces are expected to. Handforth sites sculpture both inside and out—a bronze wolf-head and ubiquitous (post Whitney Biennial 2004) bent streetlight are situated on the street. He casts an ostentatious command over the gallery, the street and the surrounding area. ‘Rope Snakes’, an eight foot bronze cast of two ropes, coiled and intertwining is charmed into shape by Handforth and shares the same sentiment, old-fashioned romantic, as the more modest ‘Sidewalk Heart’ in the smaller, partitioned section of the gallery. Where ‘Rope Snakes’ is robust and industrial, ‘Sidewalk Heart’ is a more delicate, slightly profane, pipe, twisted into the shape of a heart. Coloured candles line its slight frame as if it is a memorial to a love lost or sculpture itself; the sentiment is a token to the efforts of the other, more robust works in the exhibition. Handforth wisely separates this work by the partition wall that divides the gallery, rendering ‘Sidewalk Heart’ with gentle affection. Dan Flavin is the easy comparison to anyone who uses fluorescent lights, but for Handforth this comparison is a bit lax—their uses are contradictory and only fundamentally relevant to the material he uses. ‘Tumbleweed’, an elaborate star burst of different sized and coloured tubes, imposes the importance of light on the sculptural works, as well as light being the sculpture itself. Considering their banal, common usage, the use of fluo lights provokes an attention to surface that accentuates the lustre of the bronze ‘snake’ work and the sheen of the steel ‘Big Green Star’, all lightly tinted in a pinkish cast. There is something endearing about Handforth’s use/choice of material that swings between youthful cheekiness and austere, Las Vegas brashness. 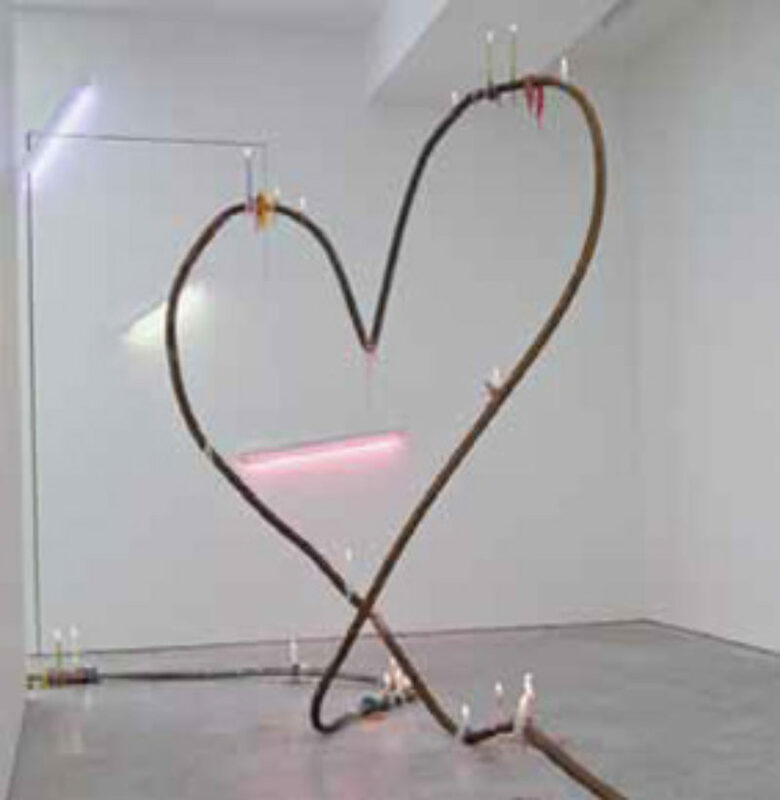 All of his works have been messed with: a bent loveheart pipe, a star with its points chopped and swapped, and outside a conspicuous ‘Starlamppost’ is twisted into shape touching the ground with its illuminated point. Lit throughout the night it identifies the otherwise anonymous building. The street or the highway—most notably referenced in the oversized ‘Rolling Stop’, which is bent and attached to the wall alongside the burning candles, underpins the aesthetic of Handforth’s work, in title and physicality. Exercising a satirical sense of humour, together with an exaggerated use of scale, he transforms these works into statements. His union of idea and material, and their successful combination, sets his work out from the current influx of sculpture that relies on failed aesthetics; he returns the practice of sculpture to the relationship between material and sculptor, rendering these works with an integrity that contradicts their ‘roadside attraction’ immediacy.